OSWEGO – Eagle Beverage representatives made their annual trip to St. Luke Health Services in Oswego with a supply of beer and other specialty beverages for residents, day program registrants, family and friends to sample, while sharing some comradery and laughs as part of their Oktoberfest celebration. 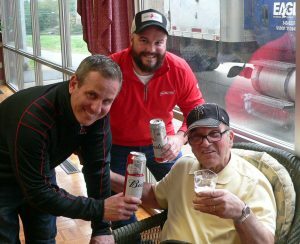 Residents at St. Luke Health Services in Oswego enjoyed a favorite tradition when Eagle Beverage, Inc. made their 12th annual visit, bringing along beer and other specialty beverages for residents, day program registrants, family and friends to sample. Eagle Beverage staff also brought conversation, laughter and camaraderie to all gathered. Pictured (left to right) is Eagle Beverage’s Dan Dorsey Jr. and Tim Mosher as they sample a favorite brew with Bruce Callen, during the Oktoberfest celebration held at St. Luke.